XTB review- Objective trading review. Find out all you need to know! 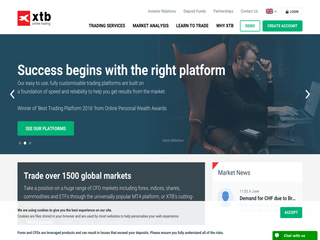 XTB prides itself not only on providing terrific online trading services but also on treating every single customer as a valued partner with the intention of securing a long-term relationship with the client to help him/her trade in a successful way. The company is a universal regulated brokerage house with over 14 years of experience in its trading sleeves and nowadays, it is the 4th-largest stock exchange that is also listed as an FX & CFD broker – on a global scale. With established offices in over 10 countries, such as France, Turkey, the U.K., Germany, and Poland, among others, it is stringently overseen by their respective supervisory entities, including KNF, CMB, BaFin, and the FCA. XTB utilises a powerful technology that revolves around average speeds of 85 milliseconds trade executions, complete trade transparency, and sophisticated chart trading tools. Besides, there is a 24/5 personalised client service and a one-of-a-kind protection of funds by the Financial Services Compensation Scheme (FSCS) for up to £50,000 per individual. If you add to that the fact that XTB provides articles about market news on a regular basis, you will realise why this forex broker is so successful. XTB’s selection of trading accounts encompasses three (3) accounts – a Basic, a Standard, and a PRO (STP) account. All three accounts of XTB derive advantage from a personal account manager, a maximum leverage of 200:1, a free account management and setup, no-requotes, Stop & Limit orders, no commissions, a Margin Stop Out level of 30%, shares commencing from 0.08%, an access to education centre and promotions, and save for the Basic account – automated trading. The minimum trading deposit for the Basic, the Standard, and the PRO (STP) accounts is £250, €250 or $250. There are certain differences between the three accounts, too. For example, while the Basic account benefits from a fixed spread and instant execution type, the Standard and the PRO (STP) accounts have market execution, and floating and market spreads for the Standard and the PRO (STP) respectively. The minimum spread for the Basic account is 2.0, for the Standard, this amount is 0.35 while for the PRO (STP), it is 0.28. The guaranteed Stop Loss orders are only reserved for the Basic account. The PRO (STP) is required to pay commissions on Forex but its maximum order size there is 100 while for the Basic and Standard accounts, this amount is 50. The maximum order size for Indices and Commodities for the Basic and Standard accounts is 15 while for the PRO (STP), that size is 100. All trading accounts at XTB are entitled to either use the MT4 or xStation trading platform. There is also the demonstration account option handy for polishing trading competencies of newbie traders. XTB takes great pride in its award-winning xStation trading platform that is not only available for a desktop, mobile, and tablet device but also for a smartwatch (a unique option worldwide). xStation is an award winner owing that to the fact that it provides absolute trade transparency, live performance statistics, real-time market commentary, and the most comprehensive charting package out there. XTB was bestowed with the ‘Best Trading Platform 2016’ award for xStation. It encompasses supersonic trade executions (85 milliseconds), fully customisable and intuitive interface, and trader statistics that permit traders to analyse themselves as well as the markets thanks to live performance. Besides, there is a Trading Calculator that can instantaneously determine how much loss or profit one could make depending on limit order, lot size, and stop loss. At investors’ disposal are also a sophisticated Chart Trading, Top Movers, an Equity Screener, and an advanced Technical Analysis. MetaTrader 4 at XTB is accessible through a tablet, a smartphone, and via a desktop. XTB’s MT4 enables users to add oscillators, signals, and indicators to their trading techniques and strategies. By making use of MT4’s potent pattern recognition tool to notice emerging trends, traders are able to perfectly optimise their technical trading. Utilising the one-click trading system permits customers to efficiently and quickly enter or exit trades. MT4 also permits the use of Expert Advisors (EAs) for automated trading. XTB is completely dedicated to crafting a unique trading atmosphere where pivotal are the security and safety of customers’ sensitive data and their funds. Not only XTB is strictly overseen by numerous regulatory entities in Europe but it is also a part of the Financial Services Compensation Scheme. This scheme shields funds up to £50,000 per individual against company insolvency or default, so you can trade with the complete confidence that your cash is protected. In addition, all retail customer funds are kept in an entirely segregated account. Now what we need is a superb customer centre and XTB is proud to have one which tackles every issue that may arise with the highest levels of professionalism, focus, and attentiveness. The support centre can be accessed via numerous fixed phone lines in 12 countries, via a live chat, and through an e-mail for each location. XTB’s headquarters reside in London, but the website is available in English, Spanish, Chinese, German, Czech, Italian, Portuguese, Hungarian, Slovak, Romanian, Polish, and French. XTB processes deposits through some of the most famous options today. Bank Wire transfers and debit/credit cards are some of them and they are gratuitous save for card transfers in USD where a 2% fee is applied. There are also e-wallets (Skrill, PayPal, and NETELLER) and the charge there is from 2% to 4%. Except for bank transfers, all other deposits are instant and are executed via the customer’s personal account panel. Speaking about withdrawals from XTB, they differ in regards to the currency. The selection of a currency and a payment option directly affects the processing time. In addition, some extra fees apply. These fees are only employed below a certain threshold. For instance, for under 100 USD, that amount is 20 units, for 80 EUR – 16 units, for 60 GBP that is 12 units, and for under 12,000 HUF – 3,000 currency units. For all withdrawals over these thresholds, no charges apply. XTB is aware that markets are very volatile and a profit is never 100% guaranteed. One thing is certain with this brokerage – they pamper their loyal clients. On one hand, if you are a keen trader who is very active on XTB’s trading platforms, for each trade you engage in, you will get a cashback – and it is a bespoke rebate scheme.On the other hand, there is the ‘Refer a Friend’ programme which yields a mind-boggling award of up to £600 for you and £600 for the friend you have referred. You only need to share your unique URL with the friend of your choice through Twitter, Facebook, or e-mail to open an account. As soon as your friend has placed the minimum trading prerequisite, you will be eligible for the bonus. And the best part – there are no restrictions on the number of referred friends!